Marketing Top Of Funnel: What Is The Top Of The Marketing Funnel? 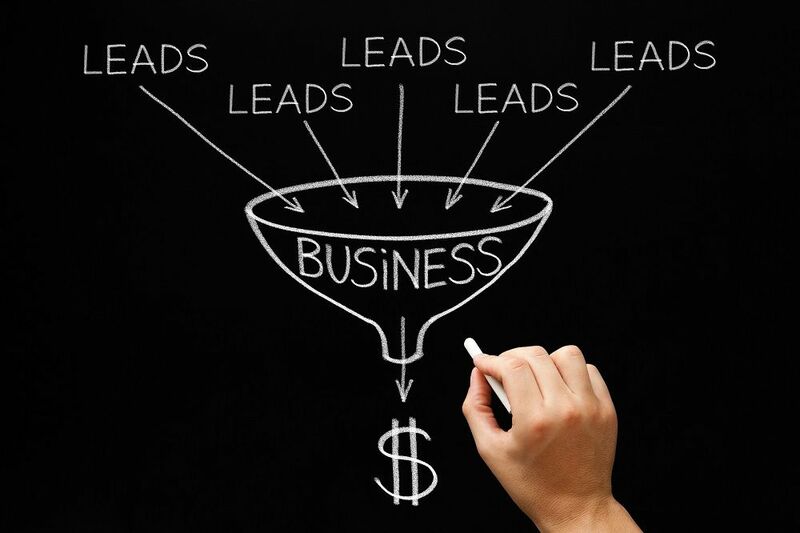 What Is The Top Of The Marketing Funnel? Traffic is at the heart of any business. It’s the lifeline that keeps your business in profit. Without it, you simply exist online. However, if you want to have a real impact, make money and start building your empire, driving traffic is a necessity. Like most entrepreneurs, you have more than likely struggled to with driving traffic to your sales funnels and landing pages. Honestly, we’ve been there. With so many traffic sources to choose from, it can be overwhelming. Do you head to social media to promote your pages? Perhaps you have the budget for targeted advertising? Or, if like most, you don’t know where to start and are looking for some reassurance, you have come to the right place. If you’ve optimised your funnels with gripping headlines, upsells, one-time offers and split tested them to eternity, you’ve built an incredibly powerful full funnel marketing offer. Once you have a professional landing page in place, it all comes down to traffic. What is at the top of the marketing funnel? Traffic sits at the top of your funnel and is responsible for bringing in relevant enquiries from genuine prospects. It determines the entire success of your funnel, which makes it high on your list of priorities. No matter what landing page software you use, if you don’t have the traffic it’s game over. Without traffic, you can’t test your pages. That means no visibility, no sales and no way to optimise your conversions. It doesn’t matter if you’re using Clickfunnels or a competitor, without traffic you are paying for software that won’t bring in a return on investment. Sounds harsh, but it’s true. It’s the same with all marketing. Traffic comes first. Optimisation and conversions come later. Traffic is at the start of any funnel. So, prioritise this before moving on to your content and the overall user experience. If you’re anything like most business owners, you are keeping a close eye on your outgoings You don’t want to blow your budget on targeted ads. Because, let’s face it, they aren’t cheap. You can pay anywhere between £1 and £50 for a single click depending on your industry and location. Obviously, if you have the budget, a targeted approach allows you to bring in leads from interested prospects. Sign up one client or make a sale and your ads have more than paid for themselves. It’s a game of risk! You can get traffic to your funnels in ways that are totally free. Do you have an existing email list? Great news. Got an active social media presence? Even better! If you don’t have any of the above, don’t worry. It will just take a little longer to build up a loyal following. But, you will get there. LinkedIn is a community of industry professionals, which makes it the ideal place the promote your business if you operate in the B2B space. Consider a marketing agency looking to generate leads from business owners. If they made a conscious effort to connect with business owners, who perhaps need a little help with their marketing strategy (let’s say they’re on page two of Google), this would soon spiral into a list of potential customers. Publish regular content. LinkedIn gives you the option to publish articles and share them with your network. The more value you offer through your posts, the more people will trust you and follow links through to your landing pages. Give them a reason to click on your content. Like anything you promote, it requires a hook. Something that appeals to the needs and desires of those individuals. “How We Increased Our Conversion Rate By 80% In A Matter Of Days.” This is a title that will appeal to many business owners, in any industry niche, with similar goals to make money online. Sponsored inmails. Reaching out directly to introduce yourself and what you have to offer shows you are proactive and friendly. But, don’t push your products and sales, straight away. The softly, softly approach works best. You could offer them a free resource to drive traffic to your landing page. Something like “As a fellow business owner, I thought you might be interested in this free guide helping you generate more leads. I hope you find it useful. I’d love your feedback.” This is an open offer that is presented in a way to help the reader, not sell to them! Facebook groups are growing in popularity. They are your chance to show off and prove that you are worth your salt. They provide people with tons of value, without the needs of direct messaging and advertising. The idea is to build a community where you provide guidance and offer advice to others. Every time you post a valuable post on your website, notify your community. You can easily drive traffic to your landing pages or website, naturally. These people are already fans of what you have to offer. They trust you to provide the best advice. However, don’t fill these pages with spam. Use it to provide relevant information that helps others. Do this on a regular basis, and people will stick around to hear more. While we agree to a degree, funnel marketing has revolutionised the digital marketing industry, this does NOT mean you should ditch your site. Having a website is essential for any business. It brings in traffic from organic searches and helps increase your search visibility. For whatever reason, if your funnel was to flop, then having a website could save your business. A website and funnel are essentially two revenue streams. Don’t kill off one, because the other is more effective. That’s bad marketing. We’d recommend setting up a knowledge hub on your existing website. This will require keyword research into the terms your potential customers are searching for. Research relevant terms and rank for them in the major search engines, like Google. Leveraging these two major social media platforms to drive traffic to your sales funnel is simple. It’s all about the power of hashtags. Those little #’s help you reach potentially thousands of customers in an instant. Pick the most relevant hashtags to your industry. Search for them directly using Twitter, see what the competition is doing, then do one better. But, don’t overuse hashtags. This can look spammy, which draws attention away from your sales message. You can also use this opportunity to engage with influencers. Find influencers in your industry and reach out to them, not only using hashtags, but tag them in comments and posts. Comment on their content to build up that relationship further. At first, you may not get many takers. But, as you repeat the exercise, over time, the responses will come flooding in. 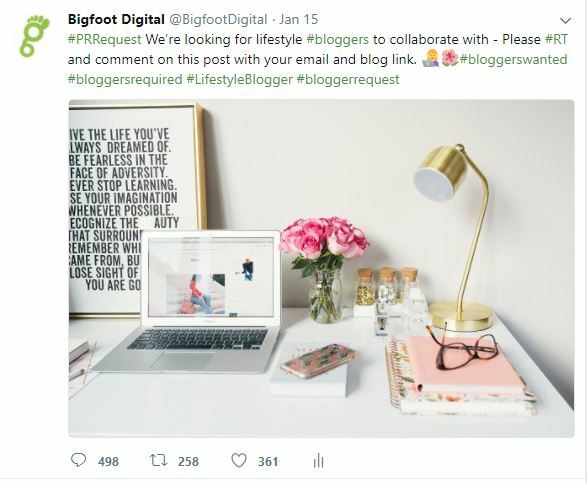 We use this tactic ourselves to reach out to bloggers on our Twitter account (@BigfootDigital 😉) This is a great way to find bloggers who are specifically looking for brands to collaborate with. Ask them to follow your account, retweet and comment on the post for a chance to be considered. This creates a domino effect as more people share your post, others see it and follow suit. The above tweet generated an impressive 498 comments, 258 retweets and 361 likes. Now, that’s engagement. All of the most influential marketers have created a podcast. If you are the face of your brand, this is a must. The founder of Clickfunnels and multi-millionaire, Russell Brunson, started his podcast many years ago sat in his car. He spoke of how his journey to become the most influential funnel marketer on the planet began from humble beginnings. You really get to know him during his podcasts; the man behind the brand. Remember, people buy from people, not brands. If they can relate to you, empathise with you and understand your journey, they are more likely to purchase. YouTube is an incredible platform. It’s the world’s second most popular search engine, behind Google. Video content can be picked up in the search results, too. 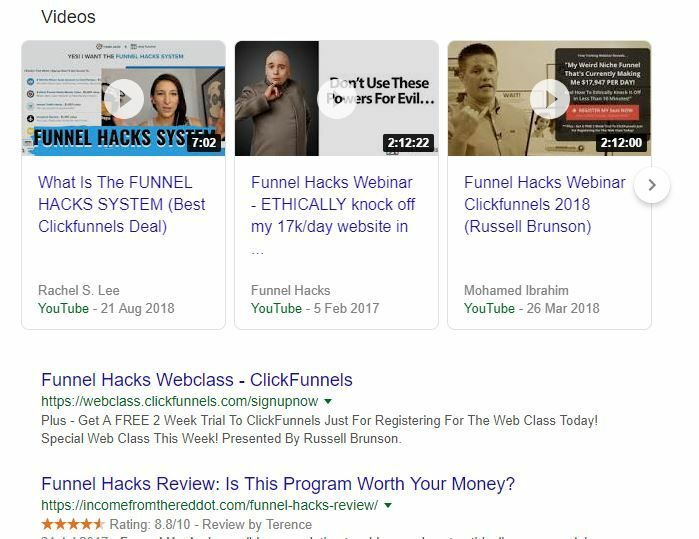 For example, people searching for ‘Funnel Marketing Hacks’ are presented with YouTube videos as well as text results. This is a great way to get more eyeballs to on your content from people who are directly searching for what you have to offer. Making educational videos on YouTube isn’t challenging. It starts with getting comfortable in front of the camera. Don’t plan every last detail before filming. This can look staged and unprofessional. Talk with conviction and confidence. After all, you are the expert. The key is to be consistent. As long as you show up and publish every week, you are going to be successful. It all starts with having an active presence. Nurture your following, and it will grow in good time. Ready to start directing traffic to the top of the marketing funnel? Speak to the experts. We hope this has answered your question “what is at the top of the marketing funnel,” and you have a clear idea on how to attract free traffic to your funnel. If you have any questions or would like help in driving traffic to your pages, we can help. Drop us a call today on 01226 720 755 or send your questions to enquiries@bigfootdigital.co.uk – we’d love to hear from you.